Up until the mid-1800’s, the Southern Plains were controlled by bands of nomadic tribes that roamed the Dakotas, Nebraska, Kansas, Oklahoma, and Texas, following the herds of buffalo that were said to be so numerous, you could travel from horizon to horizon on their backs. These tribes included: the Comanche, Kiowa, Southern Cheyenne, and Arapaho, and together they were masters of all they surveyed for over two hundred and fifty years. By the 1850’s, the western progression of white settlers was encroaching on the land that had historically belonged to the Plains Indians, leading to violent clashes between the two groups that left many dead on both sides. The settlers were not only building farms and ranches, but also communities and towns, which the U.S. government saw as the economic engine that was building a great nation. To promote and protect these settlers, the government established a line of forts along the western frontier with the goal of containing the “Indian problem”. This solution had the desired results temporarily, but with the outbreak of the Civil War, the U.S. Army abandoned these outposts and the Plains Indians once again re-established their dominance. After the war, the push west reached a fever pitch, and the outcry for military intervention became louder than ever, forcing the government to act. Various treaties were attempted, but they all ended in failure, mainly because neither side understood or trusted the other. The Indian tribes had no concept of the economic forces driving westward expansion and the government didn’t understand that the land wasn’t looked on as a commodity by the Indians, but it, along with the bison that roamed it, was a part of the people. It wasn’t just a means to an end for them, or even just a way of life, it was their life, and they would never give it up without a fight. The Medicine Lodge Treaty of 1867 was the most successful of the treaties, but it was doomed to fail just like all the others. 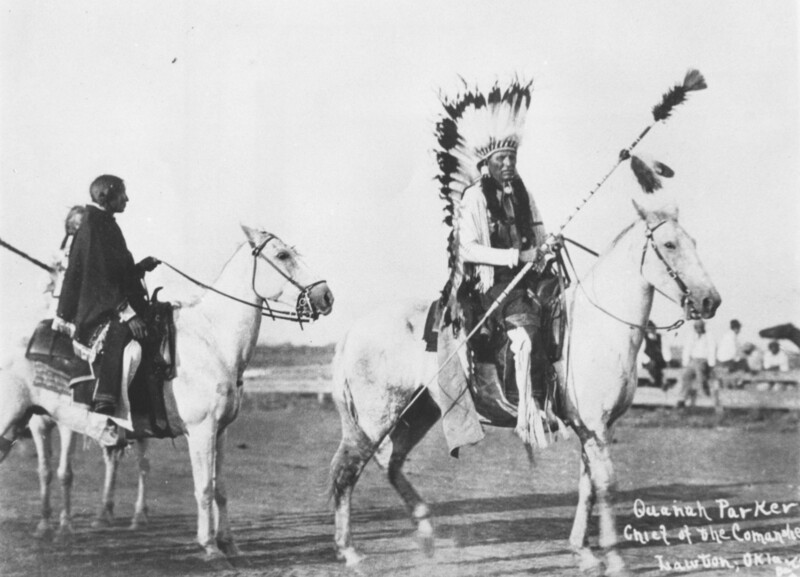 It called for two reservations to be set aside in Indian Territory, one for the Comanche and Kiowa and another for the Southern Cheyenne and Arapaho. The tribes were promised unlimited rights to hunt within their lands, but what no one counted on was the market for buffalo hides back east. White buffalo hunters stalked the large herds, shooting the animals day and night, striping the hides and leaving the rest to rot where they dropped. The Indians watched as the bison, their life’s blood, were decimated, and they realized that if they were to preserve their culture, they had to act. Renegade bands formed and headed for Texas, determined to take back their land, or die trying. As conditions on the reservation worsened, discontent among the tribes deepened, and many more braves left Indian Territory for Texas to join the renegade bands. 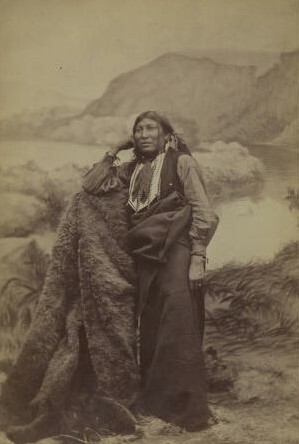 Among these Indians, was a spiritual leader of the Quahadi band of Comanche, called Isa-Tai, who claimed to have visions of the Indians rising up and driving the White man from Texas. His medicine was considered to be very strong and many rallied to his side, preferring the war trail to the bleak future they faced on the reservation. One of those who joined in the fight was Comanche chief Quanah Parker, who vowed to remove all of the buffalo hunters from the Staked Plains. On June 27, 1874, Isa-Tai, Quanah Parker, and three hundred Indians attacked the Adobe Walls outpost, where 28 buffalo hunters were holed up. The Indians laid siege to the outpost, trapping the hunters inside. 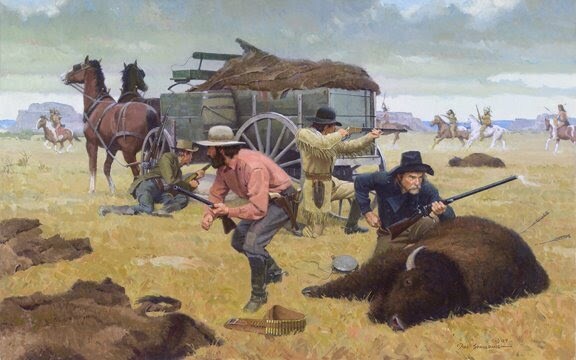 Although the Indians vastly outnumbered the buffalo hunters, their strength was of little use against the defender’s large caliber buffalo guns and Henry repeating rifles. At the conclusion of the battle, four of the buffalo hunters were dead, along with at least fifteen Indians. After the Battle of Adobe Walls, the U.S. government doubled its efforts to return the renegades to the reservations, and the army spent the remainder of 1874 chasing Quanah and his warriors across the Panhandle. They used a five-pronged attack, converging on the Panhandle from every direction, and catching the Indians in an ever tightening circle, until they had no where to run. The U.S. army and Plains Indians fought at least twenty engagements during the Red River War, but it all came to an end in June 1875, when Quanah Parker and his band of Quahadi surrendered at Fort Sill. The Red River War was just one series of battles in the long and tragic clash between the Native Americans and the White man, but the U.S. Army had found a strategy that worked, and they would use it great effect. The war marked the end of a way of life for the Southern Plains Indians, but it was also the beginning of the end for all tribes who roamed freely across the American West. I hope you are all having a great start to the new year, and I look forward to sharing many more stories of Texas as we go through 2019. Now saddle up, get out there, and enjoy all that the great state of Texas has to offer.